From complete acoustic and electronic drumsets, snare drums, cymbals, sticks, heads and accessories to showcases at major festivals and scholarships to summer music camps, this year’s Hit Like A Girl contest offers participating drummers the highest value and widest variety of prizes in the history of the program. In total, more than $20,000 in prizes will be awarded to the Champions and runners-up, and popular and Weekly Winners, in the Under 18 and Over 18 age divisions of the Drumset category. The top drummers from both age groups in the Concert, Marching and World Percussion categories will also receive drum-gear prize packages. Exceptional effort will be recognized and rewarded by the Hit Like A Girl management team in the form of Special Awards including scholarships, grants, featured performances at PASIC and the WGI World Championship, tickets to drum festivals in England and France and more. In addition to scores and comments from top drummer/educators, all entrants will receive a PowerPack3, which include free downloads of magazines and educational materials as well as a coupon for free drum lesson courtesy of School Of Rock and a HLAG 2017 Participation Certificate. This year's prizes are donated by the world’s top drum and percussion companies, including DW/PDP, Zildjian, Vic Firth, Evans, Promark, Sabian, Mapex, Ludwig, Roland, Yamaha, Yamaha DTX, LP, NFUZD, Audix, Big Fat Snare Drum, Craviotto, C+C, SJC, Sakae, TRX, Vater, TKL, Cympad, Puresound and KBrakes. Additional prizes are provided by Sweetwater, School Of Rock, PAS, WGI, Drum Channel, Hudson Music, Drum!, The Sessions, Wikidrummers/The Drumming Lab and Music Radar/Rhythm. Winners selected by celebrity judging panels and chosen by popular voting will choose from an assortment of the following drum sets. 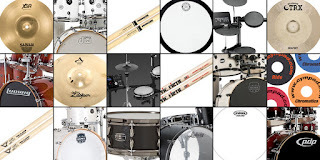 Each prize includes a selection of Zildjian, Sabian or TRX Cymbals, Evans Drumheads, Vic Firth, Promark, Vater, Innovative Percussion or Zildjian drumsticks and Cympads. The Design Series is a highly versatile, 8-ply, all-maple kit featuring DW’s F.A.S.T. (Fundamentally Accurate-Sized Tom) depths, MAG snare drum throw-off, True Pitch Tension Rods and DW heads by Remo. Sizes include 22"x 18" Bass Drum, 16" x 14" floor tom, 12" x 9" and 10" x 8" mounted toms, and a 14" x 5.5" snare. Ludwig Keystone drums feature American craftsmanship and are designed for players seeking volume, attack and power. The shells are made from a three-ply classic maple core with 1/16" inner and outer plies of American Red Oak, creating a thin dense shell that speaks loudly with quick, even decay. The 4-piece kit includes a Keystone X Snare Drum and an Atlas Pro Hardware Pack. Featuring a unique maple/walnut shell composition coupled with the SONIClear™ bearing edge, the Mapex Saturn V Tour Kit is acclaimed for its big sound and easy tuning. The kit includes 22” x 16” bass drum, 16” x 16” floor tom, 12” x 8” and 10” x 7” toms, 14” x 6” snare drum and Mapex Armory 800 series hardware. The acoustic drumset is further enhanced with the NFUZD hybrid pack that features an NSPIRE sound module plus a tom trigger pad, slip pad mount and cowbell trigger pad. The TD-25KV features high-end V-drums playability in a mid-level kit for home and studio. With a sound engine derived from the TD-30, the TD-25KV delivers all the features and playability that make Roland’s V-Drums the choice of pro players everywhere. Premium features include a streamlined interface, built-in audio recording function, mesh-head pads for a natural feel, positional snare sensing for enhanced expression and the VH-11 V-Hi-Hat for playing with authentic hi-hat techniques. The cymbals have a natural feel and support chokes and bow/edge sounds on crashes, and bow/edge/bell sounds on the ride. The legendary KD-9 Kick Drum Pad offers a natural-feel head and rock-solid response. Ludwig's Evolution Maple 6-piece kit with snare drum is designed to provide everything today's drummer needs. These drums are constructed of 6-ply poplar shells for big, open tones. The kit features a hardware pack with double-braced hi-hat, boom and snare stands, throne and kick pedal. Drum sizes are 22" x 18" bass drum, 16" x 16" floor tom, 12" x 9 and 10" x 8" toms, and a 14" x 5" snare. The Mars Series Shell Pack offers 100% Birch, shallow depth shells with the new SONIClear(TM) bearing edge, producing a clear tone with a fast response. The Mars drumset features 6-ply shells with a 22” x 18” bass drum, 16” x 14” floor toms, 12” x 8” and 10” x 7” mounted toms and a 14” x 6.5” matching birch snare. Included Armory black plated hardware includes boom cymbal, snare and hi-hat stands plus a double pedal. The Concept Series by PDP has been reimagined to appeal to today's drummer. It features birch shells that deliver classic punch, focus, and attack. Additional high-end features include STM (Suspension Tom Mounts), True Pitch tension rods, MAG throw-off, die cast low-mass claw hooks and proportionate counterhoops along with DW's 3000 hardware. The kit includes a 22" x 18" bass drum, 17" x 14”, 12" x 9" and 10" x 8" toms and a 14" x 5.5" snare drum. Additional sounds are provided by LP 14" and 16" Street cans and Trash Snare. Celebrity judges’ selections in the Marching and Concert Percussion categories (in the upper and lower age divisions) will receive snare drums from Yamaha, Mapex, Ludwig, Sakae, SJC, Craviotto and C+C. World Percussion category winners will receive hand percussion from LP and GonBops. Additional prizes include Evans Drumheads and Vic Firth, Promark, Vater, Innovative Percussion and Zildjian drumsticks and mallets. Weekly winners in the upper and lower age divisions are chosen by teams of industry executives and endorsing artists each week from February 1 through March 13. Weekly winners receive a splash cymbal from Zildjian, Sabian or TRX, Evans drumheads, drumsticks from Vic Firth, Promark, Vater, Innovative Percussion or Zildjian, a Big Fat Snare Drum sound enhancer, a Lola Blu Hit Like A Girl T-Shirt and an assortment of Cympads. Special Awards are determined at the conclusion of the contest and are awarded on the basis of performance, geography and/or need. In addition to providing coupons for a free lesson to all Hit Like A Girl participants, School Of Rock will award a full scholarship to one 12-week “Performance Program” that combines private lessons, band rehearsal and a performance at a real music venue. Past programs have included the Beatles, Motown, Pink Floyd's The Wall, Led Zeppelin, Van Halen, AC/DC, Best of the 80s, Punk Rock, Devo, Frank Zappa, Queen, and many more. The recipient of the School Of Rock “Rising Star” Award will be chosen by School Of Rock teachers, directors and executives based on skill, talent, attitude and potential. A snare drum from Yamaha, Mapex, Ludwig, Sakae, SJC, Craviotto or C+C is also included. The Joe Hibbs Award presented by The Sessions is an annual award given in the name of Joe Hibbs, the former artist relations director for Mapex and a great supporter of the Hit Like A Girl Program. The $500 grant will be given to the Hit Like A Girl contest participant who demonstrates the highest levels of dedication, ambition, persistence and integrity— the values that made the late Joe Hibbs such a positive influence on the drumming community and so respected by the people he worked with. The Over 18 Drumset Champion from the 2017 Hit Like A Girl Contest will be invited to perform at PASIC 2017, the Percussive Arts Society International Convention, November 8-11, 2017 in Indianapolis, Indiana. Courtesy of PAS and HLAG. This prize includes travel and hotel accommodations for one person. The Over 18 Marching Percussion Champion from the 2017 Hit Like A Girl Contest will be invited to attend the Winterguard Championships, April 20-22 in Dayton, Ohio. Courtesy of WGI, Ludwig and HLAG. This prize includes travel and hotel accommodations for one person. Chosen by media sponsors Wikidrummers and The Druming Lab, HLAG T-Shirts and one pair of tickets to attend the Wikidrummers Festival in Paris, France on April 9, 2017 will be provided to the outstanding French entries in the under and over 18 age divisions. Travel, lodging and other expenses are not included. Chosen by media sponsors Rhythm Magazine and MusicRadar, HLAG T-Shirts and one pair of tickets to attend the London Drum Show in London, England on November 11-12, 2017 will be provided to the outstanding UK entries in the under and over 18 age divisions. Travel, lodging and other expenses are not included. Special awards for “Talent Deserving Wider Recognition” will be determined by the producers and management of the 2017 Hit Like A Girl contest. These awards will include snare drums from Yamaha, Mapex, Ludwig, Sakae, SJC, Craviotto or C+C and drumsticks from Vic Firth, Promark, Vater, Innovative Percussion or Zildjian. Now in its 6th year, the Hit Like A Girl Contest has had more than 2,000 participants from 50 countries and more than 10,000,000 online impressions. Sponsors have included many of today’s leading drum, percussion, hardware, electronics and media companies while judges have included some of the most popular, most important and most influential drummers on the planet. Hit Like A Girl’s 2017 co-spokesperson is Kimberly Thompson.